This shop has been compensated by Collective Bias, Inc. and its advertiser. All opinions are mine alone. #SamsClubMag #CollectiveBias It’s time for a roasted root vegetable medley. 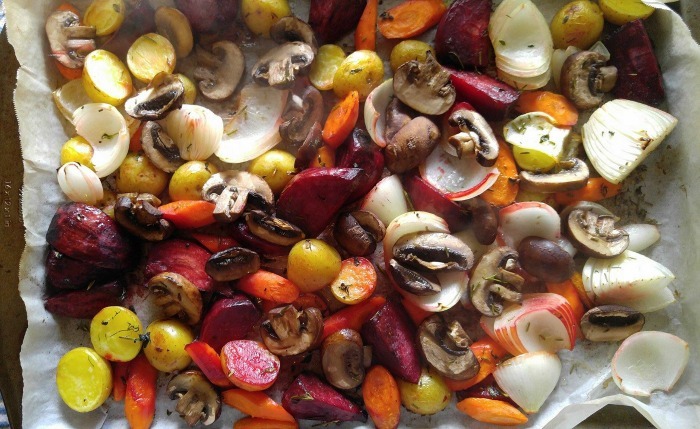 Fall flavors combined to make this roasted root vegetable medley a hit with your family. This post may contain affiliate links for your cooking experience. For me, fall is the time for anything cooked in the oven. I roast vegetables all fall and winter long. 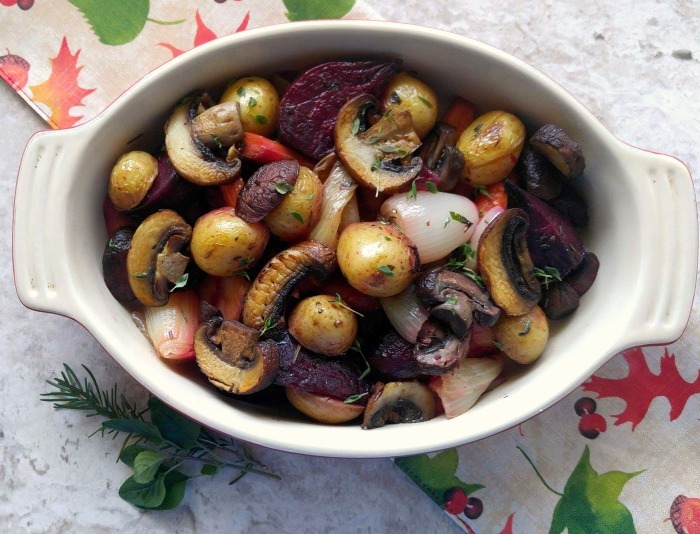 Roasting veggies brings out their natural sweetness and makes it a cinch to serve them to kids who cry out “I don’t like vegetables!” This Roasted Root Vegetable Medley combines the plentiful root vegetables available this time of the year with another of my favorites – mushrooms! I still have lots of fresh herbs growing on my deck, so I shipped some of them to give my dish a boatload of flavor. 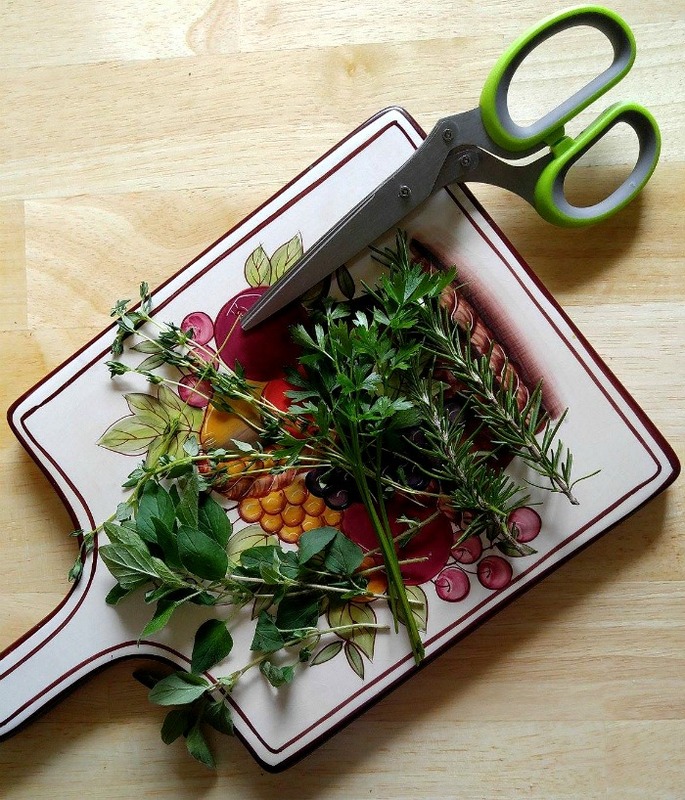 My new herb scissors makes mincing them easy to do! I love shopping at my local Sam’s Club for all my fruit and vegetable supplies. I find that the quality is wonderful and you just can’t beat the prices. Since my family LOVES vegetables and fruits, it is my go-to place for fruit and vegetable shopping. 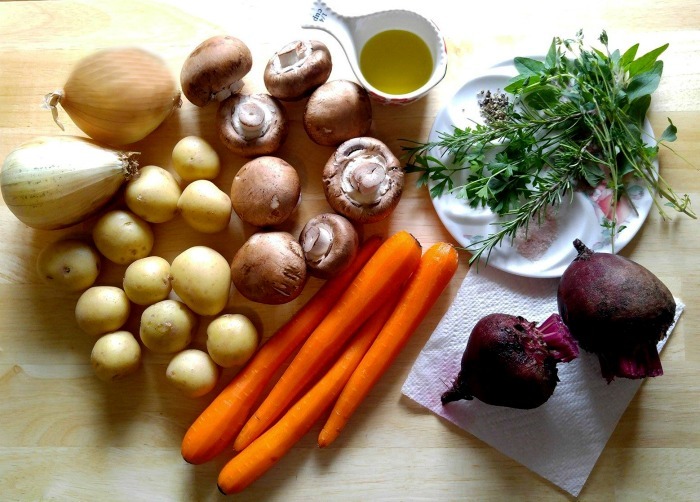 For today’s shopping trip, I chose baby potatoes, fresh carrots (long carrots have more flavor than the baby carrots) yellow onions and of course, my super food of the month – mushrooms. Some fresh herbs and sea salt and pepper, as well as extra virgin olive oil, rounded out the ingredients. 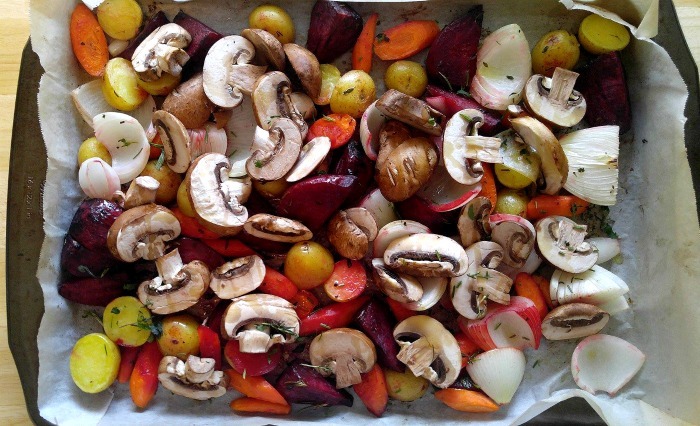 Since we are doing a two step dance today in the kitchen with this Roasted Root Vegetable Medley, everything except for the mushrooms go into the oven to cook for about 15 minutes. This gives me a chance to clean my mushrooms and cut them into slices. I made mine a bit thicker than my carrot slices. I want them to hold up well in the dish when it is finished. A quick stir of the partly roasted vegetables and then, in go the sliced mushrooms to finish off for 15 minutes. 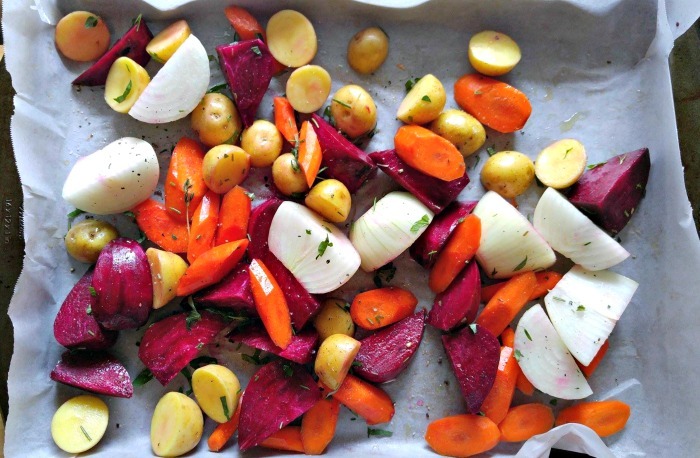 I LOVE the aroma of this Roasted Root Vegetable Medley as it comes out of the oven. The veggies have a slightly grilled look to them, almost as though they have been cooked on a BBQ grill and the sweetness that the roasting gives them is just amazing! 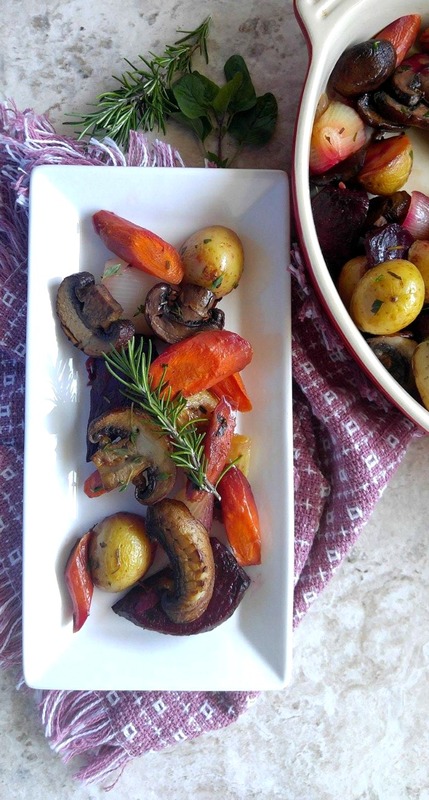 This Roasted Root Vegetable Medley makes the perfect side dish for any protein. It will be the star of your Thanksgiving table, for sure! I love the colors in this dish. From the deep purple of the beets to the orange of the carrots, these root vegetables will delight both the eyes and the stomach. Add in the tender mushrooms and you have a dish made in comfort food autumn heaven. 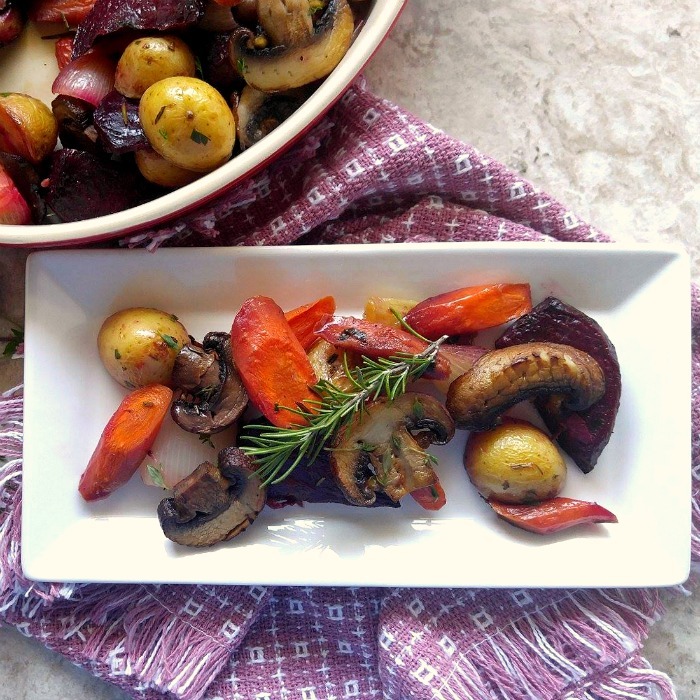 Are you ready to try this Roasted Root Vegetable Medley? Head on over to your local Sam’s club and visit their fruit and vegetable aisle to pick up your ingredients. While you are there be sure to have a good look around the store. 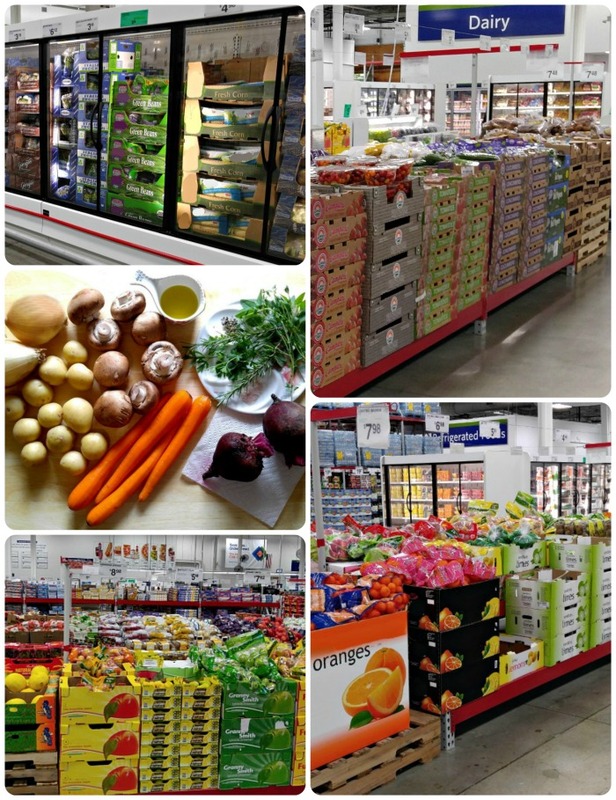 Sam’s Club is the ideal place for all the items that you need for scrumptious eating at home, including fresh produce, fresh and frozen meats and fish, and all of your other healthy living needs. Best of all, you can purchase everything in bulk at great prices. Also, be sure to check out Healthy Living Made Simple, an online Sam’s Club magazine that is the ultimate place for all of your health and wellness needs. It is a super magazine and you can find lots of great health advice and details of superfoods. The super food for September and October is mushrooms, which is why I wanted to add it to my new recipe. One article that I found interesting this month is one that talks about diabetes diagnosis step by step. For more healthy cooking recipes, be sure to visit my Pinterest Healthy Cooking board. Peel the carrots and cut on the diagonal into slices about 1/4 - 3/8 inch thick. Cut the potatoes in half and quarter the onions. Peel the beets and cut into apple slice sized slices. Toss the vegetables with 1 Tbsp of the olive oil, sprinkle with the fresh herbs and season with sea salt, and cracked black pepper. Spread on large baking sheet liked with a silicone baking mat. Roast the vegetables for 15 minutes. While the vegetables are roasting, wash the mushrooms and dry with paper towels. Slice mushrooms into even slices, slightly thicker than carrots. Toss the mushrooms with 1 tbsp of olive oil. Remove the vegetables from the oven, stir, add mushrooms and roast 10-15 minutes more. Serve hot, sprinkled with fresh parsley if using. We just loved the flavor of it. So sweet and tender. YUM!